MESSEL BOWFIN - EOCENE GERMANY. 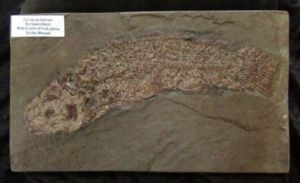 The 'classic' fish from the World Heritage fossil locality of Grube Messel, Germany. Normal Messel preservation for display. The detail of the skull, scales, vertebrae, fins and tail under magnification is incredible. A perfect Eocene fish from one of the most famous fossil localities in the world. Fish : 24.5 cm. long.